Is your e-mail in-box the bane of your existence? Mine used to be. I would joke to colleagues that it was like a zit I had to pop every day or it would get out of control. So, after that delightfully gross comparison (yes, I work with middle grades kiddos), I want to share a cool little thing I found on the Internet that just might brighten your in-box. 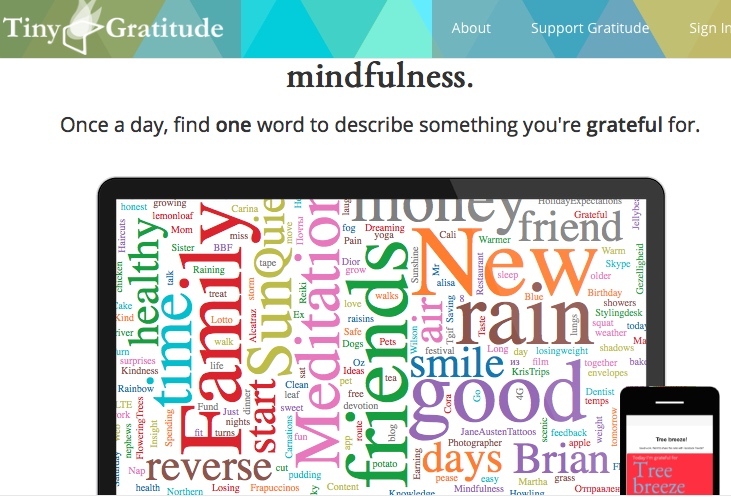 To try it out, sign up at tinygratitude.com to get an e-mail that prompts us to think of just one word of gratitude each day. You respond, it makes a word cloud, and boom–a little more gratitude in your in-box. I like the simplicity, and I find it delightful. If you want to give it a try, it only takes about 10 seconds to sign-up here.